Steven Legget - Bathhouse. Vinyl LP. Bleep. Incredible and moving work from Newcastle native Steven Legget, released via our good friends at Firecracker. 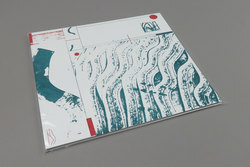 Label head House of Traps gives physical form to Legget’s modern classical soundscapes composed in homage to a local Turkish bath house. Field recordings of water cascading over elegant interiors are juxtaposed with freeform cello motifs to provide an immersive sound experience that fits right at home with the current obsession for drifting ambient musics. It’s a testament to Firecracker's reluctance to be pigeonholed that a label can swiftly move between MPC house and slow-mo boogie into records like Bathhouse. Tyne City Pool never sounded so good!